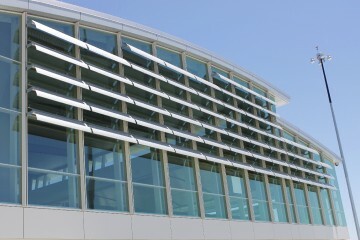 Aluminum sun shades help conserve energy by reducing exposure to direct U.V. rays while allowing for ambient day lighting. 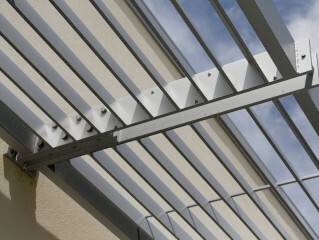 Arizona Glass Specialists offers a variety of louvers and fascias from several manufacturers. 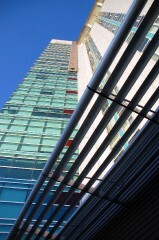 Versatile anchoring systems allow the sun shade to be anchored for a variety of conditions, including curtain walls, storefront and other substrate, such as concrete and brick. 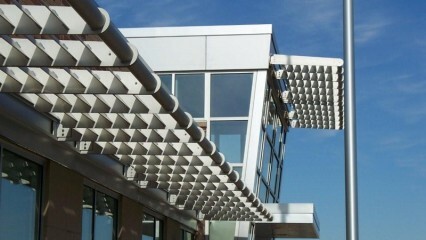 Aluminum sun shades are available in an array of painted and anodized finishes. Architectural Light Shelves are designed to help reduce the need for artificial lighting in buildings. This horizontal shelf is a high-functioning architectural element containing a highly reflective surface used to shine daylight onto the ceiling of a building's interior, allowing it to penetrate deep within the building. Due to their overhang, Light Shelves conversely provide shading near windows, thereby reducing window glare. This reduction in both glare and heat gain leads to more productive energy use and earns LEED points toward energy-efficient building construction.